Community Emergency Response Team or CERT is a critical program in the effort to engage everyone in America in making their communities safer, more prepared, and more resilient when incidents occur. Community-based preparedness planning allows us all to prepare for and respond to anticipated disruptions and potential hazards following a disaster. Effective response therefore requires comprehensive planning and coordination of all who will be involved. 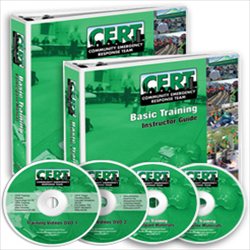 The CERT Program is designed to train individuals to be assets to help communities prepare for effective disaster response. Included are two Manuals and two free colorful posters displaying disasters. It is produced by ToucanEd. Community Emergency Response Team or CERT is a critical program in the effort to engage everyone in America in making their communities safer, more prepared, and more resilient when incidents occur. Community-based preparedness planning allows us all to prepare for and respond to anticipated disruptions and potential hazards following a disaster. Effective response therefore requires comprehensive planning and coordination of all who will be involved. The CERT Program is designed to train individuals to be assets to help communities prepare for effective disaster response. Included are two Manuals and two free colorful posters displaying disasters. It is produced by ToucanEd.